My hook is still moss stitching away, gradually adding more sections to the third strip of my blanket. I’m not sure about you, but I finding I seem to be inadvertently taking part in a slow crafting movement. This may, or may not exist, but it’s definitely a thing in my house. I honestly goggle at all the ‘It’s finished!’ posts on Instagram some days. I wonder if they’re not telling us that it’s just been a case of darning a few ends, or sewing up a seam, on a pile of long ago started makes? Whatever. I do not feel any compunction at all to compete, but I do enjoy looking at all the makes. 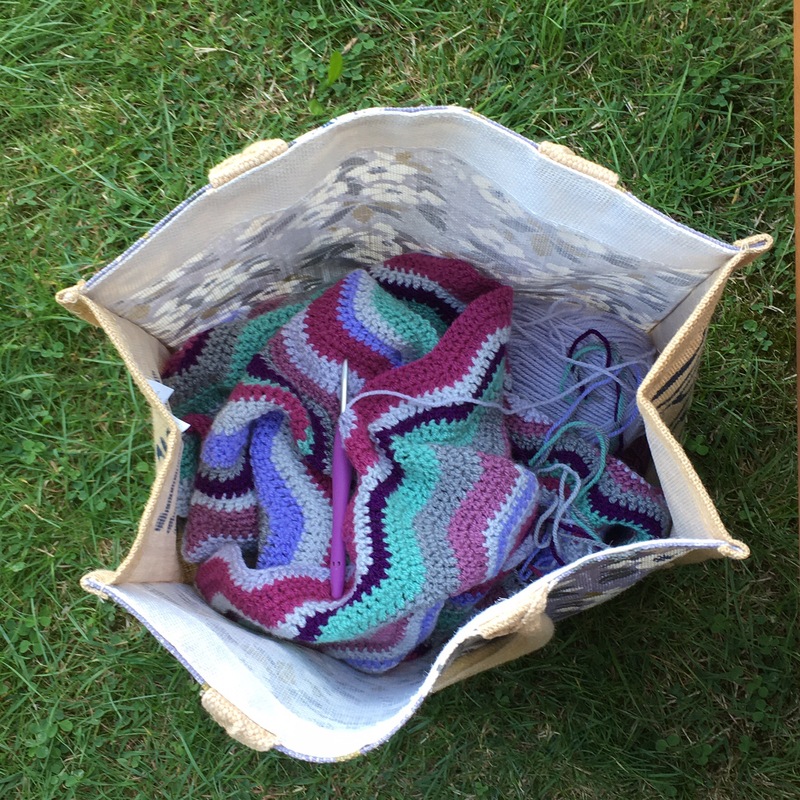 The strip’s a bit further on now, as you’ll see at the end, but I like this photo showing my snuggly Tilted Squares Blanket in use. On Friday afternoon I went to the Members’ Preview Day of the V&A’s new exhibition Ocean Liners: Speed and Style. The picture above shows part of one of the rooms where you’re meant to feel as if you’re on deck. The floor is wooden, there are some examples of chairs and a bell-boy’s uniform (to be a totally immersive experience I would have loved a G&T brought to me while I led on an actual recliner!) The whole of the wall is a projected film of the ocean, moving waves, the sound of sea-gulls and nothing as far as the eye can see; oh apart from a movement on the right. Gradually a steam powered liner comes into view and hey! It’s racing along besides us. There were many oohs and ahhs from people, then the inevitable selfies. It’s fun. Afterwards walking through Hyde Park, back to Oxford Street to meet a friend for dinner, I saw so many lovely snowdrops. They are so delicate and as the RHS state are a very, very welcome assurance that the bright days of spring are on their way. Many crows… And this cheeky pigeon, who only moved at the last moment as I inched closer and closer. What an unexpectedly agricultural scene! There was a huge fairground set up in the park over Christmas, called Winter Wonderland (otherwise known as ‘be aware and hold on to your purse, while gaping at the exorbitant prices’.) So I imagine this is the process of flattening and fertilising the area before it’s re-turfed. An eye-catching memorial for Remembrance Sunday leftover from November, while we were wandering around Witney market on Saturday. I like the mixture of felt and yarn. It looks good still. Often yarn bombing looks bedraggled and dirty quite quickly. Now I’ve only got 3 more teeth left to knit of my Hitchhiker, so hurray! Nearly done (again) and then I can start something else. 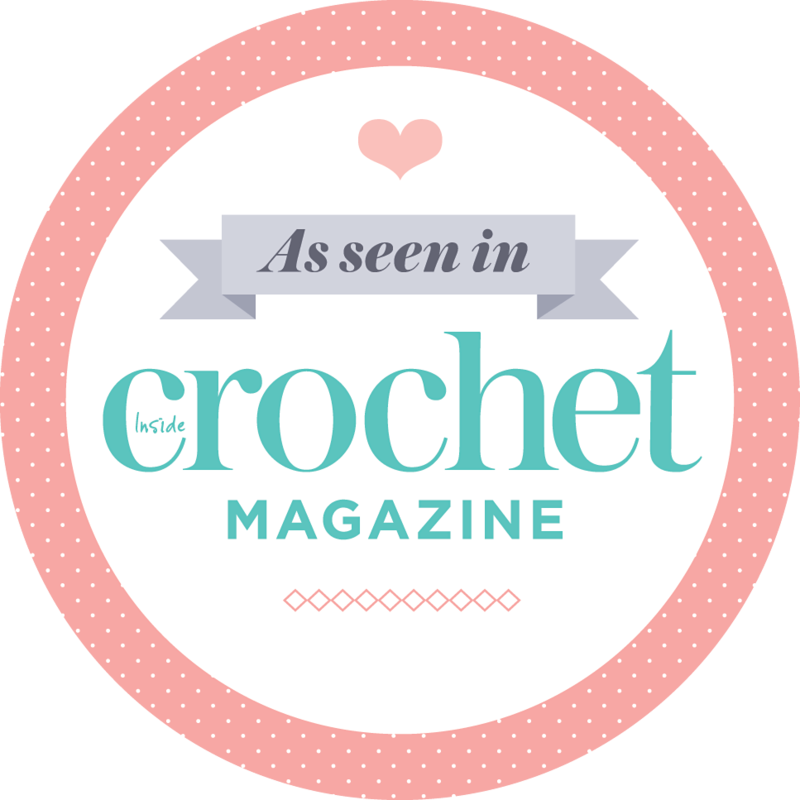 Recently I’ve decided that having one crochet and one knitted thing on the go is good. I don’t really want any more than that at one time. It’s handy to have a choice, especially for knit night when it’s chatty and I need to concentrate. Something you can do without lots of looking is good too, as it’s not well lit in the pub at this time of year. Have I said all that recently in another post? Sorry if I’m repeating myself. And in a nutshell, at the moment I’m watching: Feud, a BBC drama series about Bette Davis and Joan Crawford, reading: Cranford by Elizabeth Gaskell, listening to: Three Things about Elsie by Joanna Cannon and tonight I’m cooking aubergine biryani. What about you? What are you watching, reading, listening to and cooking? I’m genuinely nosy interested. Yesterday I went to the fabulous V&A in London, officially: The Victoria and Albert Museum. The museum’s focus is upon decorative arts and design. The beautiful rooms are crammed full of amazing objects which you can see anytime for free, they also put on staggering good ticketed temporary exhibitions. I’m lucky enough to be a member and so can go into these anytime without booking and for free. Yesterday’s was the best I’ve been to: You Say You Want a Revolution? Records and Rebels 1966-1970. 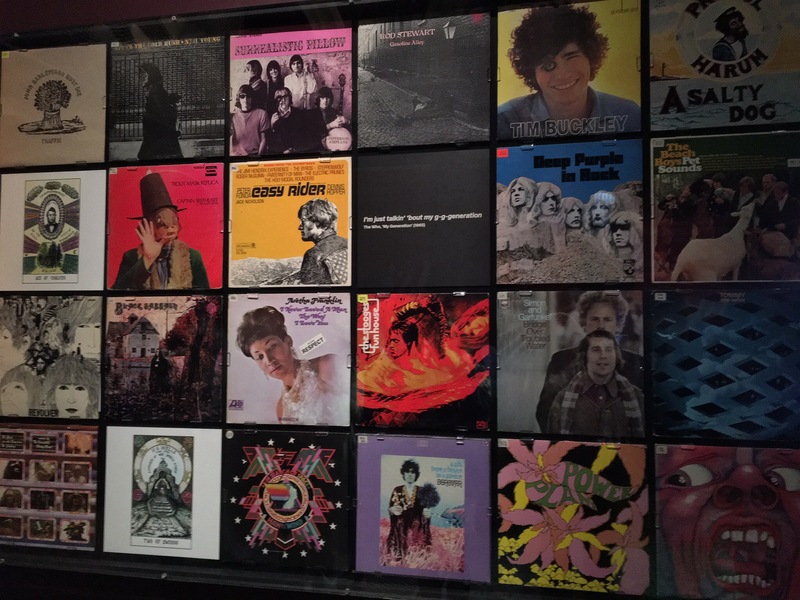 There are many album covers from the period on display (I’d like a full list of these, must check the website) and many badges for sale in the shop at the end. You are forbidden from taking photographs in this exhibition, which turns out to be a good thing because you’re not distracted. I went in at around 3:30pm, totally immersed from the start in the music and clips which automatically play on your headset as you move around the rooms, reading, looking, thinking. 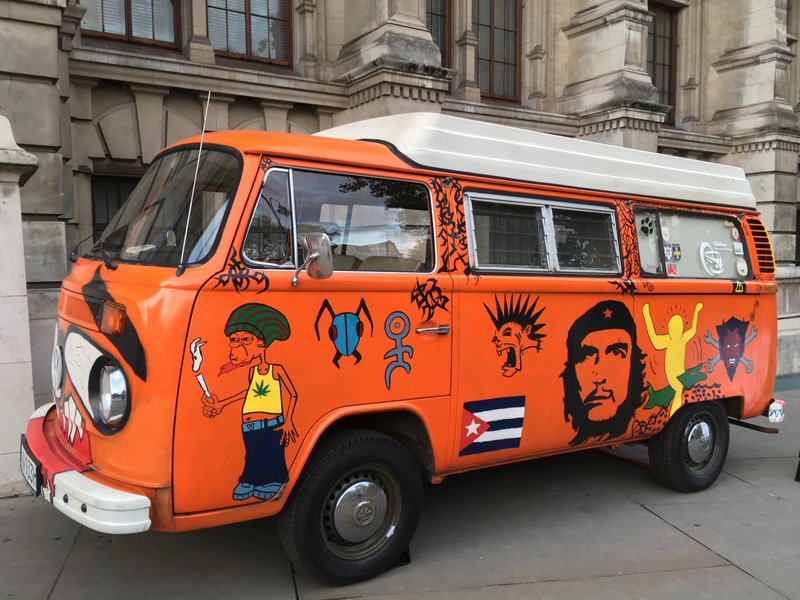 Near the end I led on a giant beanbag watching three walls of projected footage from the Woodstock festival, held in 1969 on a farm in Upstate New York, trying not to sing too loudly! It was a mesmerising exhibition. Noticeably no one had mobile phones out (this is rare anywhere, you’ll agree) and by the end I nearly fell on the floor with surprise when I looked at my watch and it was 6pm! This is from West Cornwall last week. 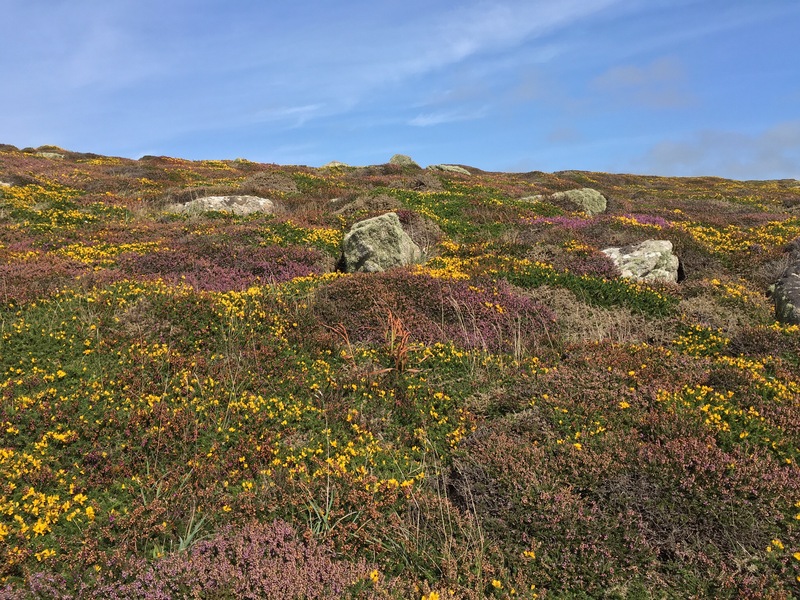 The colours of the sky, rocks, heather and gorse are stunning aren’t they? Quite a few times we saw cars left in gateways, off the tiny winding Cornish lanes, as people hopped out to take a photo of the same. This my Yorkshire blanket, the first crochet I’d ever done, when I picked up a hook and tried making trebles. 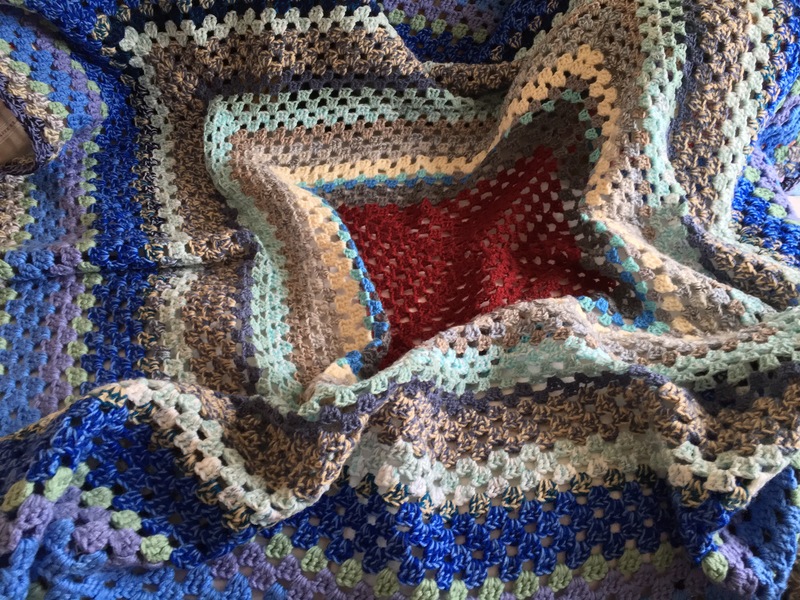 It’s pretty funny that the first crochet I ever did resulted in a full blanket! Mum made the starting ring and I carried on, with her help. It’s The Yorkshire Blanket because we’d hired a cottage there over Christmas 2008 and this is what I worked on, before going down with influenza (not “flu” which is typically a heavy cold.) I remember feeling like death warmed up for most of the time! No Christmas dinner for me, I was too unwell. That’s proper ill that is! Anyway I’m really not sure what to do with this blanket, because we started off with the claret coloured DK single stranded. I carried on using a mixture of yarn that Mum and my Mother in Law passed on to me. Others I picked up from charity shops. It’s all acrylic and the tweedy appearance is because some yarn was thinner than others, so I ended up holding it double two strands at one time. Of all the blankets I’ve subsequently made this is still my favourite in terms of colours; it’s more ‘me’ I suppose. Of course there is a real discrepancy in weight between the centre of the blanket and the rest. It was initially a ‘can I learn to crochet?’ practice piece, but turned into a full square blanket because of course I could, and I couldn’t stop. It really doesn’t work with the weight of the outside rounds pulling at the lighter weight centre. There’s been no unraveling however. My darning must have been sterling! 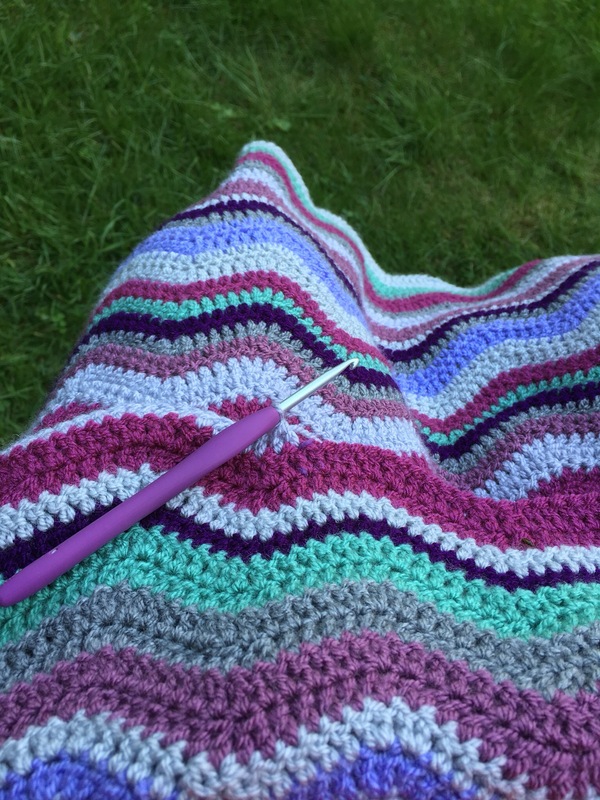 And my current blanket, The Unnamed Ripple, as I sat in the shade a few days ago catching up with a few rows. This one’s going to a friend who lives on a canal boat, I ought to get cracking with it so she can use it this winter. Don’t forget that if you’re in UK you can enter my giveaway to win a copy of Edward’s Imaginarium before noon on Sunday 25th. Leave a comment on the post linked here.